Audio version of this lesson available here. Bumper stickers, T-shirts, viral YouTube videos, and pop religion books are filled with the pious sounding mantras of “I love Jesus but I’m not religious” or “I’m spiritual, but not religious.” Though presented as a humble and simple declaration of faith in Jesus alone, it is delivered with a spirit of judgment and superiority over Christians who attend worship services and strive to live holy lives in an ungodly world. Adherents to this attitude emphasize the grace of God as all Christians should, yet teach it as a grace that makes no demands on the believer; a concept foreign to the gospel. They frequently quote Matthew 7:1 “Judge not, that you be not judged” but generally not the rest of the passage or the many other New Testament passages that require Christians to make judgments about themselves and others. This attitude is a show of piety but in words and actions they deny the Jesus they claim to exalt. It appears from the articles and videos promoting this attitude that it is the ritual observances, organization of believers, and moral code governing affairs that believers are required to follow that it is the source of their grief. Problem Considered: To be an acceptable attitude to God it must be demonstrated that Jesus condemned ritual observances, the organization of believers into a group, and a moral code governing affairs that believers are required to follow. However, if the scriptures demonstrate that Jesus encouraged and established these things then it is the attitude of these people that is out of step with Jesus. The latter is, in fact, what we find in the scriptures. When Jesus lived as a man he had reverence for the Old Law and was obedient to it. In Matthew 5:17 he said that he came to fulfill the Old Law. Matthew 5:19-20 records Jesus condemnation of those who took a casual view of adherence to the law and urged his hearers to be exceedingly righteous. He condemned the Sadducees because they didn’t know the scriptures and embraced error as a result, Matthew 22:29. Many conflicts with the Pharisees occurred when Jesus violated their traditions, not the Old Law itself. To reinforce the seriousness of obedience, when discussing judgment, Jesus said he’d send his angels to remove those who cause sin and are law-breakers from the kingdom, Matthew 13:41. He condemned those who disobeyed the Old Law by following man-made traditions. In Matthew 7:21-23, Jesus condemned those who claimed to follow him, even doing great works, but had no relationship with him. The problem was not adherence to ritual or good works but expecting good works apart from a relationship with Jesus to have any effect. Jesus is praised for keeping the law without sin, Hebrews 7:26. His religious life is evident as he studied in the temple (Luke 2), attended synagogue worship and even delivered a message during an assembly (Luke 4), and he observed the Jewish feast days such as the Passover. Jesus had to deal with the abuse of the law by those who claimed to love God but he did not urge a rejection of religion, just the error practiced by men. He condemned hypocrisy in the Pharisees but he told his followers to listen and obey what they taught from the Law while rejecting their example, Matthew 23:1-3. In an often quoted passage, Jesus did not say that it was wrong to follow the strictness of the tithe (as some claim) but that it should be done in addition to not forsaking the weightier matters of the law, Matthew 23:23-24. Problem 2: Jesus and his apostles established a religion! Some adherents to this philosophy want to separate the work of Jesus and the apostles (accept Jesus but reject the teaching of the apostles relative to doctrine) but they cannot be divorced. Instead, Jesus reinforced the authority of the apostles in matters of religion. 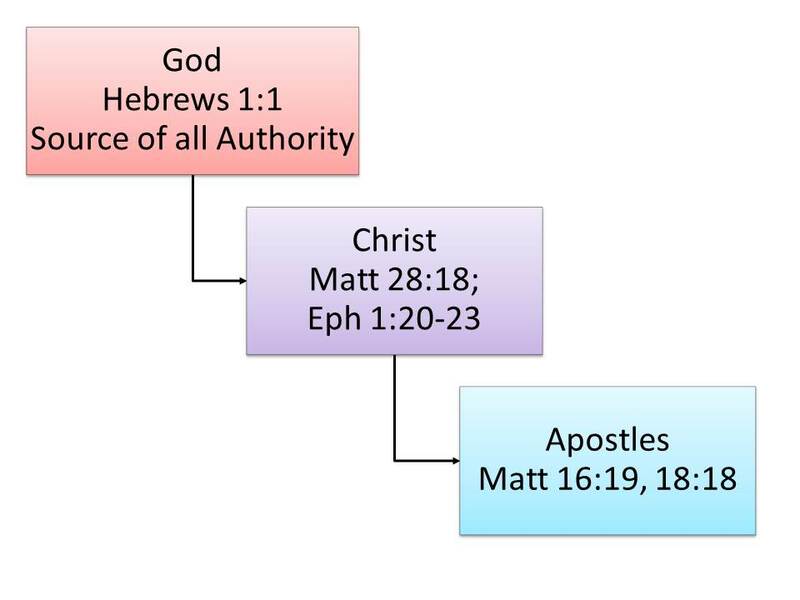 As the chart illustrates, all authority flows down from the Father through Jesus to the apostles. The authority form the apostles consists of their teaching and example. The Bible condemns those who do not abide in Christ’s doctrine (2 John 7-11), who follow traditions devised by men (Matthew 15:1-9), and any other authority but God’s word (Galatians 1:6-9, 2 Timothy 3:16-17). If one wants to condemn the organization of believers into a body (as opposed to just serving God without the church) he will have a problem with Jesus who founded the church, Matt. 16:18. Far from being a foolish organization designed by men, the church is a reflection of the wisdom of God, Ephesians 3:10-13, and is the body of Christ, Ephesians 1:22-23. Take up stones also to condemn Jesus for instituting ritual practices for on the night before he was betrayed, he instituted a memorial meal to be observed in the church to remember his sacrifice, Matthew 26:26-28, 1 Corinthians 11:17-34. He also commanded his disciples to baptize those who believe the gospel and, sorry if this is scandalous, teach them to observe all of his teachings, Matthew 28:19-20. Not only did he teach, and commanded his apostles to teach, obedience to his commandments, he outlined what to do when brethren disobeyed the law, Matthew 18:15-20. The apostles reiterated the teaching of our Lord against those who were disorderly, 2 Thessalonians 3:6-15; 1 Corinthians 5:1-5; 2 Corinthians 2:5-11. He went so far as to equate love for him with adherence to his commandments, John 14:15, 21. The strictness of the moral code of Christ will not sit well with the “I just love Jesus and don’t judge others” crowd. Unlike many who claim to follow Christ today, Jesus had a very narrow view on divorce and remarriage, Matthew 5:31-32, 19:3-12 that caused even his disciples to question whether it might be better to not marry than to marry unwisely. Many in the religious world do not condemn the behaviors condemned by the apostle Paul in Romans 1:18-32 and, instead, condemn Christians who teach that this behavior is “ungodly and unrighteous.”(Paul’s words) Likewise, they bristle against restrictions on sexual immorality, filthy language, and materialism though the apostles, by inspiration of the Holy Spirit, condemn that as well, Ephesians 5:3-12, declaring such behaviors as improper for Christians. True religion, and the word is used in scripture, is praised in James 1:26-27 through the exercise of one’s faith. Paul warned that times would arise in which men would reject the strict teaching of our Lord and the apostles and find teachers who would allow them to indulge in their passions but have the appearance of piety and serving God, 2 Timothy 3:1-9; 4:1-5. Seems like this is such a time. Many in the “I love Jesus but am not religious” movement are hesitant to say that those in non-Christian religions will not be saved, yet the Savior himself insisted that salvation is only through coming to the Father through him, John 3:16-18; 8:24; 14:6-7. Some advocates for this attitude embrace the argument of the atheists that religious people are the source of more suffering in this world than good. It is a foolish argument that fails to recognize the incredible countless actions by humble Christians who have provided the lowliest service to their fellow man. No one can deny that atrocities have been carried out in the name of Jesus but those actions are out of the boundaries of the moral code of our Lord and true Christians condemn such abuses. Jesus didn’t throw out the Old Law just because the Pharisees added their traditions. He condemned their error and upheld the holiness of the Law. Jesus addressed the hypocrisy as a problem with people, not God’s law. Wars fought in the name of the Prince of Peace do not mean that Jesus was pleased with such actions. That some opportunistic leaders and political-religious leaders co-opted the cause of Christ to wage carnal warfare does not mean that all Christians are right to support such action. Some Christians are pacifists and oppose all war, especially in the name of Jesus. The true warfare of the Christian is not of this world and is waged with wars not earthly weapons, 2 Corinthians 10:3-5. Some claiming to be Christians have used political intimidation and violence to persecute and kill other Christians who did not agree with them. Such actions are not approved by the New Testament and yet the problem was with the individuals and the religious bodies who perpetrated such vile actions, not the church established by Christ. To condemn the religion of Christ because some people used the name of Christ to make war, oppress others, or to advance their political goals, is naïve and ignorant at best. At worst it is misleading, prejudiced, and arrogant. As described above, the moral code of Jesus and the apostles is quite strict. However, some in the modern popular Christian movements are quick to defend a very permissive view of divorce and remarriage, sexual immorality, foul language (even cursing from the pulpit), materialism, and a host of other behaviors with a “judge not” halo glowing over their forehead. They like to emphasize grace but it’s a man-made grace where everything is acceptable, not the Bible grace that calls men to repentance, Romans 2:4. They like the Jesus who forgives but forgets he is also the one who says, “Go your way and sin no more” (John 5:14; 8:11). They like when Jesus says “judge not” but forget that he is also the judge who will weigh the hearts and actions of men on the last day, John 5:30; 12:48; Matthew 12:36. There have been similar times in Bible history where, instead of following the law of God, “every man did what was right in his own eyes” to the great displeasure of God, Deuteronomy 12:8; Judges 17:6; 21:25. However, Proverbs 12:15 tells us that it is the fool who follows what is right in his own eyes and does not follow the wisdom of God. Some claim the church should be a hospital for the broken, which is appropriate since Jesus is a physician for those broken down by sin, Matthew 9:12. However, a person goes to the hospital to be healed, not to continue in the sick condition. Jesus calls us from the filth of the world to live clean and pure lives (2 Peter 1:3-4; 1 Peter 4:1-5). It is strange that some are content in their “broken” condition instead of recognizing that God is calling us out of the world into holy living as part of our “reasonable service,” Romans 12:1. Seems that some are ‘holier than thou’ about the virtue of their lack of holiness. Yet God wants us to be holy because he is holy, 1 Peter 1:15. Like so many Christians, I am disgusted by the materialism and immorality that has characterized so many prominent groups and individuals claiming to be Christian. I mourn for the carnal warfare, persecutions, and abuse carried out in Jesus’ name or by those who claim allegiance to Christ. I believe that much of the “Christian” world reflects a hijacked religion that departed from the simplicity of the gospel in the New Testament. However, I cannot throw out the true religion of Christ because some institutions and individuals have left the way of Christ though they claim a relationship with him. If you love Jesus, you will love religion—the religion that he established, that is described in the New Testament, and that reflects the glory, holiness, and righteousness of our great Lord. ‹ Why Is School Boring?